If you want to know more about your subscribers than just their first name and email address, but you don't want to intimidate them with a lengthy signup form, then creating a multi-step form is the way to go. This method can also be used for creating surveys and questionnaires. First, you need to create the "starting" form, the first form in the process, or if you already have it, go to its form summary page (e.g. by clicking the form's name in the tree menu). If you would like to create a multi-step signup process, then the "starting" form should be a signup form. If that form uses a double opt-in signup process, then the second form in the process will appear after signup confirmation. If you would like to create a multi-step questionnaire, which you would use to find out more about your already existing subscribers, then the "starting" form needs to be a profile update form. 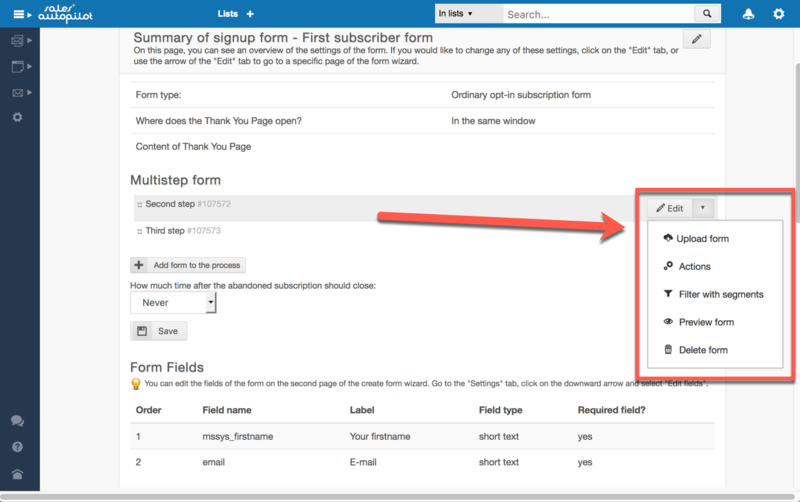 Click the Add form to the process button on the Form summary page of the "starting" form. The additional forms will be profile update type of forms automatically, don't change that. 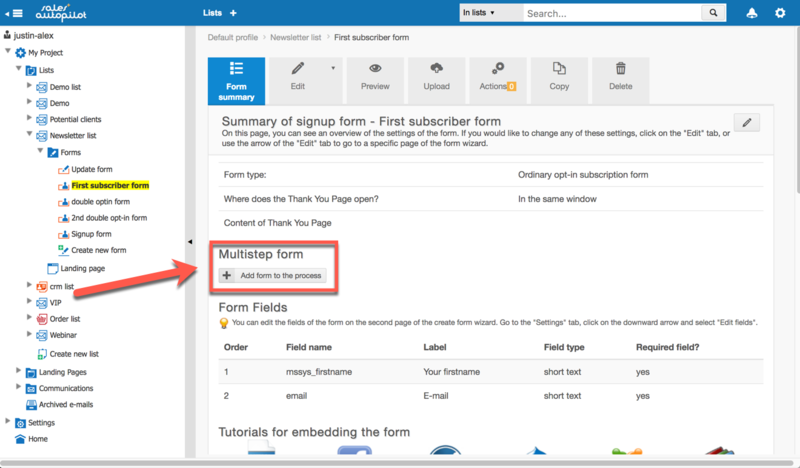 Once you have created the profile update form, you will be taken back to the Form summary page of the "starting" form, and you will see the new form under the Multi-step form section. You can add more forms to the multi-step form by clicking the Add form to the process button again. If you want to edit one of these form, click the Edit button by the form's name. You can access the form's HTML source code by selecting the Upload form option. 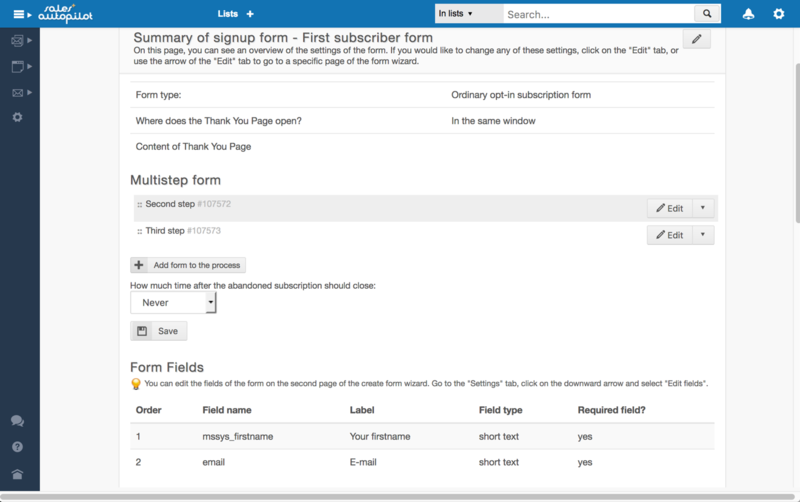 You can also add actions to any of the forms, or look at their preview. If you would like to delete a form from the process, click the Delete form option. If you have added more than one additional form to the process, then you can change their order by dragging and dropping them. In a multi-step signup process, the system doesn't display the Thank You Page of the "starting" form after it is submitted. Instead, it displays the next form in the process. If there are three forms in the process, then the Thank You Page of the second form won't be displayed either, but the third form will appear after submitting the second form. Then, after the third form is submitted, its Thank You Page will be displayed. Only the Thank You Page of the last form in the process will be displayed. Therefore, that's where you should write the instructions that may be needed after signup. As we have mentioned before, if the "starting" form is a double opt-in type of form, then the signup confirmation page will appear before the second form. The second form will appear after the subscriber clicks on the signup confirmation link they receive via email. You can create a multi-step form sequence where different forms appear based on the details provided by the user. For that, select the Filter with segments option. In such a case, the form will only be displayed to those subscribers who are in the segment(s) you select. Select the segment(s), and then click on the Save button. You can filter any of the forms with segments. If you filter the last form with segments, and a given subscriber is not in any of those segments, then they will see the form's Thank You Page instead of the form itself.